The leg press is a compound strength-training exercise that requires the involvement of a collection of muscles in the lower body. Your glutes are considered the primary muscle involved during the leg press, which means they take on the greatest amount of load. You can increase the involvement of your glutes even further by adjusting the position of your feet on the platform. Never begin this or any other exercise regimen without first consulting your doctor. "Glutes" is used as a short term for the gluteus maximus muscle, which is located at your buttocks. It originates up at the pelvis and then runs down your backside and attaches to the top of your femur and tibia bones in each leg. It's primarily responsible for extending your hips, which means it drives your legs back behind you. It also contributes to adduction, which occurs when you lift your leg out to the side. There are a couple different versions of leg presses, but no matter whether you do the seated or lying press, the idea is the same. You place your feet up onto the platform so that they're positioned hip-width apart, and then extend your hips and knees to push the platform away from you. Control the platform back to the starting position by bending your knees and hips, and then extend them again to go into the next repetition. Because the leg press is a compound exercise, it requires movement around multiple joints and thus recruits multiple muscle groups. While your glutes take on most of the work, your quadriceps at the front of your thighs contract to straighten your knees, and your soleus, which is one of your calf muscles, contributes by straightening your ankle joints as you push the platform. In addition, your adductor magnus, located at the inside of each of your thighs, helps the gluteus maximus out with hip extension. If you're interested in placing even greater emphasis on your glutes, you can tweak the position of your feet on the platform. 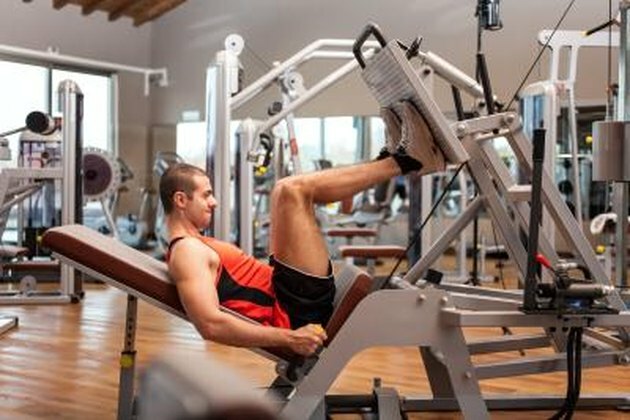 According to ExRx.net, by placing your feet higher on the platform, you end up having to complete more hip extension, which forces the glutes to do more work. Placing your feet lower on the platform decreases hip extension and increases knee extension, which in turn makes your quadriceps work harder.